Just under seven years ago in the summer of 2010 I had something of a musical revelation. It was then that I first encountered the remarkable, powerful and intensely moving music of the Swedish composer Tommie Haglund. This took the form of his 2005 work Hymns to the Night – Symphonic Poem for violin and orchestra. If you missed that work before I urge you to seek it out now. I thought so then, and I still believe that that is one of the great pieces of classical/contemporary music written by any composer in recent years. Since then I have had the great good fortune not only to get to know much more of Haglund's music but also to meet the composer himself and indeed I attended the concerts and recording sessions for the Cello concerto performed here. I have to admit that Hymns to the Night represents something of a 'first love' for me regarding Haglund's music, but this new disc is a quite sensational conspectus of his music from the 2001 Cello Concerto to the 2015 Serenata per Diotima. Individually and collectively, for all the artists concerned this is a superb achievement. The various groups of performers play with sovereign technical address and utter musical commitment. BIS who are justly reknowned for the quality of their engineering and production have produced a disc of true demonstration quality with the added bonus of being possibly the longest single CD I have encountered: 83:46. I listened to the SA-CD layer in stereo rather than surround and the combination of opulence and detail is breath-taking. Especially in the deeply atmospheric concerto the breadth and depth of the sound stage is remarkable and wholly apposite – as will become clear later in this review. All credit to the BIS and Gothenburg management teams for supporting this project wholeheartedly. Give players of this calibre time and you can get results this good. For all the benefits of recording concerts 'live', it does strike me that this format – intensive rehearsals, a pair of concerts with a studio recording the next day is the most preferable – with all the financial implications of such dedication. I recall that the concert was also broadcast live on Swedish radio, and in the concert hall the performances were greeted with great and justified acclaim by an enthusiastic and intensely engaged audience. So to the concerto itself: Haglund usually gives his works a very specific title in this case Flaminis Aura. According to the excellent liner by Haglund's close personal friend Erik Wallrup, this describes a state immediately prior to religious revelation. I think the key word here is ‘revelation’ with the sense of the doors of perception opening wide to embrace a sense of the universal. Again according to the liner, the first work that Haglund considers as the starting point of his 'real' composition was the 1988 Intenso animi. But he was to wait another thirteen years until Flaminis Aura to write a work scored for full orchestra. In that context Haglund uses the orchestra with remarkable skill and confidence and indeed many Haglund compositional fingerprints can be heard here. A central one is his preference for large, single-arch forms. Both Hymns to the Night and Flaminis Aura run to over thirty five minutes of continuous music. For the players – and the soloists especially – this makes for a hugely demanding performance. Indeed in the cello concerto the soloist barely rests at all. I have been pondering long and hard quite why Haglund's music has such an impact. A partial explanation might be that he has found that most elusive of all things: a way to balance deeply personal, very humane utterances with a musical/technical style that is unapologetically contemporary. Too many contemporary composers – and I write as someone who spent many years playing a lot of this type of music – seem to have sacrificed emotion in their music for form or effect. Emotion does not have to mean gushingly sentimental tunes lushly orchestrated, it simply is an acknowledgment we respond with emotions to the universe around us and perhaps Art should reflect these responses. Haglund demands a lot of his audience and listeners too. Not just by the length of the works but also their densely argued content, this is music that reveals its deepest inner beauties over time and repeated listenings. Haglund expresses his music in unmistakably human ways; he works on passages until they "feel" right, he will consider revising a work if "the work still aches within me". The choice of titles I think is telling too. Very often there is a 'human' element implicit in it. The violin concerto seemed to me to represent an inner spiritual journey, simplistically put from darkness to light and Wallrup points out that much of Haglund's music articulates a "musical study of the human interior". Conversely, Flaminis Aura, appears to be working on a more universal scale. 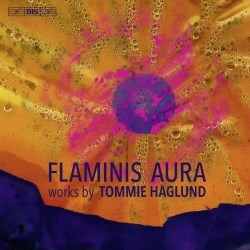 Part of what I particularly like and admire about Haglund's music is that he achieves wonderfully original, transformative instrumental textures without resorting to the "extended instrumental techniques" beloved of many contemporary composers obsessed with doing something "new". But around the 27:30 mark Haglund pulls a quite brilliant near–theatrical effect from the bag. He underlays the orchestral/soloist's texture with excerpts from NASA recordings of earth made in space. The genius of this is that the ear is not blatantly drawn to this. Rather, the sound floor of the recording widens and deepens as though some massive doors have opened behind the players and we are suddenly aware of a vast infinity stretching beyond – a sense of "chasming sheer to infinite space". Its sounds fantastic in the stereo version I have listened to, I imagine the surround-sound must be something again. After about two minutes of this "revelation" the doors close and there is a definite sense of the music slowly withdrawing in the closing pages. The soloist in the concerto is the principal cellist of the Gothenburg Symphony, Ernst Simon Glaser, and he proves to be a magnificent player wholly immersed in the work. The reception at the concerts from his colleagues was deservedly warm and appreciative as it often is when a player steps from the ranks of the orchestra such as here. The intensity and collective brilliance of the playing from all the orchestra is remarkable. Admirers of Haglund's music might know the previous off-air recording of the work made by its premiere performers John Ehde, Okko Kamu, and the Helsingborg SO. That performance remains blazingly fine and an important document not only because of its status as the first performance but also because it uses the original version of the score whereas this new disc uses the 2004 revision. According to Haglund, the revision constitutes little more than fifteen bars of music but this includes a key additional 'pillar' which recur through the work. The concept of these pillars is another central facet of Haglund's music. He is not an atonal composer but neither is he 'tonal' in any traditional sense of the word. Rather he creates harmonic nodes – in a cosmic sense, one could say ‘gravitational centres’ – around which the music rotates. To give a greater clarity to the structure he felt an additional pillar/node was required. Fascinating to compare the two soloists: Ehde has been a performer of Haglund's work for many years and he has a big musical personality to go alongside a superb technique. Glaser gives nothing to Ehde in technical terms but broadly speaking his performance is more lyrical, perhaps finding more of a connection between the 'inner' and 'universal' aspects of the music. This seems to pay particular dividends in the space-sound passage, where the harmonics and overtones in the solo part are given a more spectral, other-worldly quality by Glaser. Unsurprisingly, in purely technical terms, the new BIS recording is superior to the older radio–sourced one, but surely the mark of a great piece is the way different performances can reveal different facets of the same music – so it is here – and I would not want to be without either performance. Mention here too for the young German conductor David Afkham who clearly had studied this score in great depth and detail. Again Haglund makes great demands on all the performers to maintain the concentration and intensity over these extended spans and by definition the conductor is the focal point for that. Afkham rose to the occasion with considerable brilliance and is certainly a name to follow. Whilst the concerto is the centrepiece of the disc, in no sense are the other three works of lesser musical stature. It remains an utter mystery – and personal bugbear of mine – that the UK musical institutions seem resolutely indifferent to Haglund's work. How we can stage a series of concerts every year which promotes itself as the "world's greatest classical music festival" [The Proms] and ignore the work of one of Europe's leading living composers while including Oklahoma and tributes to Ella Fitzgerald (all of which I love genuinely but Classical music....?) mystifies me. There have been exceptions to this. To the sunset breeze was premiered at Wigmore Hall with John Mills – Haglund’s guitar teacher during his studies in London – and Susan Drake on harp in 1997. Another was the commission and first performance in Cambridge of Il regno degli spiriti by the ever excellent Medici Quartet. This Land of Souls again functions to give the work a human context and framework without extending to any kind of specific narrative. The source was a Native American legend where a chieftain's daughter dies before she is due to marry but reunites with her betrothed in the realm of the dead – the title's land of souls. Again this is a substantial single span of music – here running just short of twenty minutes. The string trio ZilliacusPerssonRaitinen [ZPR for short] are joined by 2nd violin Julia Kretz-Larsson to form a quartet. This is more superbly skilled playing which makes light work of the considerable technical and musical demands Haglund asks. Fine playing from all four players but Cecilia Zilliacus' lead violin is especially beautiful, stratospherically sweet-toned and gossamer light. I particularly like the way they perform this music in a very expressive and overtly emotional way – again giving lie to the idea that somehow contemporary music cannot also be a vehicle for emotion. Perhaps I am reading something into the work led by the title but there is a sense of yearning and even loss here that is very powerful. In part this may be explained by the fact that Haglund studied composition with Delius' amanuensis Eric Fenby who introduced him to the older composer's work. One of the catalysts for the composition of Il regno degli spiriti was the death of Soldanella Oyler, Fenby's great love from his years with Delius at Grez sur Loing. The textural richness that is achieved in this work is a testament to both the skill of the composer and the players. Another demonstration-worthy BIS recording repeatedly tricks the ear into thinking that surely more than just four players are performing here! The quartet dates from the same year as the concerto but it is more overtly emotional in the sustained intensity of the music. I wonder if a transcription for full strings has ever been considered? Interesting to make a comparison with the performance recorded by the first performers: the Medici Quartet. The sound as recorded is less flattering to the Medici's – rather closer and quite analytical. More interestingly the overall effect is of a more fragile, even vulnerable piece. Not just because the Medici's do not play with quite the sovereign technical address of ZPR but also because their performance has a less flowing or fluent approach. I do not say that as a criticism, simply that the Medici's are mining a different vein in the music. The newer recording is a full three and half minutes quicker than the old. If at a push I had to choose one I would say the fluency of the new performance is wholly convincing but – and I come back to the significance of the 'human' element in Haglund's music – the extra vulnerability and world-weariness of the Medici's approach is most affecting too. There is a third version that can be streamed via YouTube from the French-based Manfred Quartet. Timing-wise they sit closer to the Medici's although without their weighty style. It is not clear from the listing on YouTube where this recording originates from although a discreet cough or two would imply a concert setting. Again the technical quality of the playing is very impressive although of the three performances I think this is the one that is not as strongly defined in its approach as the other two. But proof, if proof were needed, that top quality international ensembles are keen to explore Haglund's unique musical visions. The following work Sollievo (dopo la tempesta) is possibly even more of a tour de force in its handling of a small string group. For whatever reason, the catalogue does not exactly groan under the weight of great music for String Trio (violin, viola & cello). To my ear this seems to be an important and valuable addition. Not just because there are fewer instruments, Haglund seems to be striving for a greater clarity of linear composition. Wallrup points to presence of influences as diverse as Orlando di Lasso, Palestrina and even the use of sustained 5ths typical of Swedish folk music. There is a biographical element too – the solace after the storm referencing Haglund's recovery from painful treatment after back surgery. Again, it would be quite wrong to seek a specific narrative. There is a strong sense of drama and mood instead. Remarkable playing from ZPR who manage to play at the very edge of technical implosion without sacrificing a jot of superb ensemble or perfect intonation. This group commissioned the work and gave the first performance so no real surprise that this recording is as wholly convincing as it is. As with the two preceding works, the work slowly dissolves into meditative silence. The disc is completed by the most recent work offered here and also the one that is Haglund at his most instantly accessible. The Serenata per Diotima was written in 2014 in part as a response to the birth of his first grandchild. A combination of this life–enriching event and the ongoing development of a more clarified approach to textures and musical lines results in a work of great lyrical beauty and emotional directness. One of Haglund's great musical loves, although you would struggle long and hard to hear any overt influence, is the music of Delius and he referred to this Serenata as "the most Delian piece I have ever written." But by no means does Serenata per Diotima sound like Delius, rather I think he means that it occupies a similar spiritual world where moments of transient beauty are captured in sound. As in all the works offered here, Haglund writes solo violin parts that are as dizzyingly beautiful as they must be terrifying to play. Yet, as with all the playing on this disc, the leader of the Malmö Symphony Orchestra, Håkan Rudner, is simply superb. In some ways, this is the simplest of the works presented, but in that simplicity the listener is able to hear the quite unique way in which Haglund handles his harmony and the instrumental group. Again, no extended techniques are used but time and again I was struck by the ravishing textures that are achieved. Again, the music gently fades to silence but here Haglund achieves a sense of serene rapture and farewell that makes for a very satisfying conclusion both to this work and the disc as a whole. A simply stunning disc and one that demands repeated plays. The whisper is BIS might be recording new versions of the Haglund Violin Concerto and Symphony. If this is so, that is a very exciting prospect indeed. This is the kind of music that makes you believe there is a future and relevance for contemporary music. The sooner promoters and musical institutions in the UK realise that this is some of the greatest contemporary music of the 21st Century to date, then we might catch up with the countries around the world where Tommie Haglund's music has already achieved the acclaim it so richly deserves. Unique and powerful music, stunningly played and recorded – a disc of the month and the disc of the year for me.